I have been fascinated with making decorations out of frozen spheres. 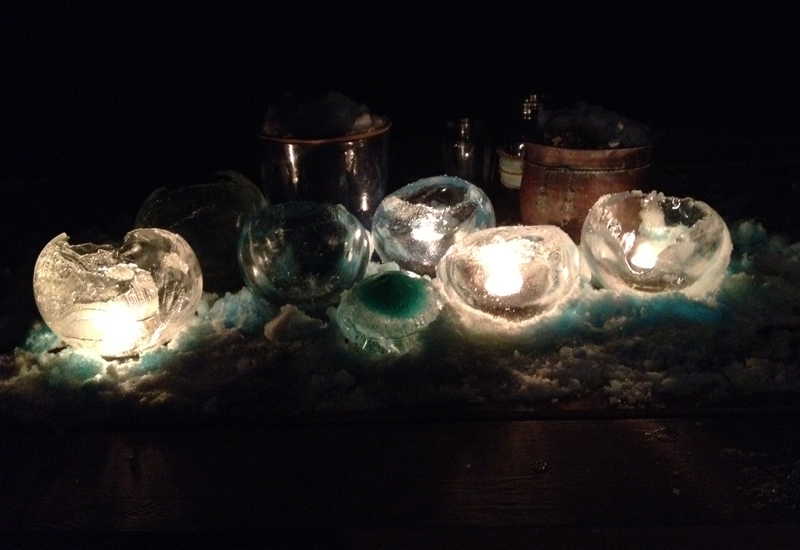 I made a large arrangement of frozen spheres for my porch, then I added candle holders made out of ice. I kept thinking that you should be able to use this idea inside, too, but I quickly recognized some drawbacks. The spheres in the large arrangement don’t just balance; they’re sort of glued in place. I poured water in between the spheres. When it froze, the spheres were stuck together. If you try to create an arrangement like this inside, the spheres will quickly come unstuck and they’ll roll off your arrangement. 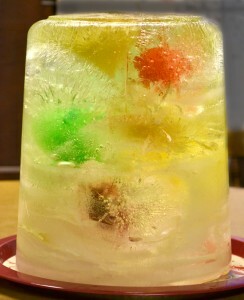 The other big obstacle for using that kind of arrangement inside is that the ice will melt. If you set your ice into something like a cookie tin or baking pan, part of your ice will be obscured from view. If you use something shallower like a tray, the tray will quickly get filled with water and overflow. In addition, when you set chunks of ice on a tray, they slide around. Professional ice sculptors use special drip pans underneath their creations. 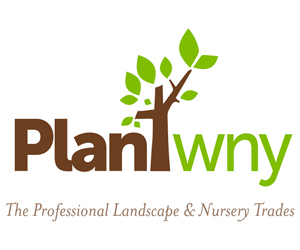 I saw one drip pan online that holds two gallons of water. Other pans have a tube that allows the water to flow from the drip pan into a bucket concealed under the table. I suppose you could try to make your own system, too, if you didn’t want to buy one. Plunking round chunks of ice into a vase seems like a simple project, but you need to do a little bit of planning. Find your vase first and make spheres that are an appropriate size for your vase. If you make them too large, they won’t fit inside your vase. If you make them small, they will melt more quickly. I wanted spheres as large they could be to fit into my vase, which is about 3 1/2 inches in diameter. As I filled the water balloons, I simply held them at the top of the vase to make sure they were the right size and let out a little water if they were too big. These spheres lasted a long time; the second photo was taken about six hours later. I think the colored water is interesting. You could make a few extra spheres and add them as the first spheres melt. I attempted a few other frozen centerpieces that didn’t work as well as I thought they might. Still, maybe they have potential. I’m including them here because one of you folks might be inspired and see a way to make them work better. One thing I tried was to create a solid piece of ice with layers of different colors. I took a plastic bowl and poured in water dyed with food coloring. I let the water freeze. Then I added a layer of another color of water. 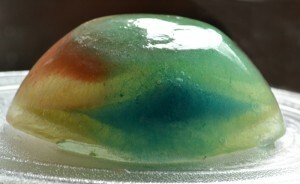 The problem was that when I added the second color, the water melted the first layer of ice a little, releasing the dye. Sometimes the water seeped down the sides of the first ice layer. The colors blended in a muddy kind of way. I didn’t even bother taking a photo that project. A variation on that idea worked a little better. I took a plastic bowl and set it in the snow at an angle. I added one color of water and let it freeze. I set the bowl at a different angle and added another color of water. I continued doing this until there was ice in the entire bowl. I took several spheres and put them in a container (I used a clean plastic waste basket). I added a couple inches of water and let it freeze before adding a little more water. I didn’t add all the water at once because I knew that even in the frigid temperatures we had, the water would melt the spheres a bit before the water froze. Unfortunately, even adding water a little bit at a time didn’t work. 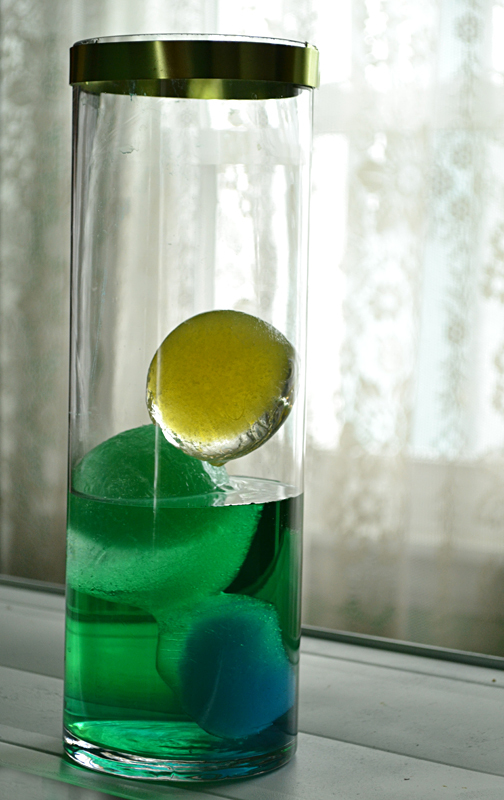 Wherever the water touched the spheres, the spheres melted a little and allowed the food coloring to dye the water. The resulting piece is unattractive. If you’ve tried making any kind of ice decorations during this cold winter, let us know how they worked for you by leaving a comment. A couple of readers have sent me photos of their icy creations, which I posted on the Your Photos page. 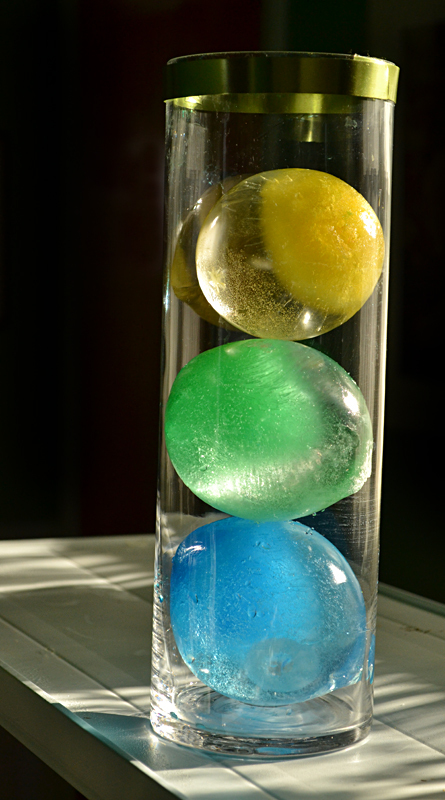 Below is the arrangement of ice spheres that Garda O’Keefe of Youngstown created for her deck. It is lit with candles and looks spectacular at night. 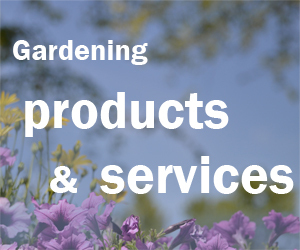 You can email me a photo at connie@buffalo-niagaragardening.com. You are obsessed! Just kidding. You are right that there are some limitations on having them indoors, but the vase was a very nice solution. I hope that people aren’t tired of this topic. I wanted to try making these last year, but the weather wasn’t consistently cold enough. This year I’ve had lots of time to experiment. Garda’s deck set-up is very nice! That igloo is so cool! I’ll have to find out how they get the ice bricks to fit together to form the ceiling. There is a way you can make a vase by placing a smaller container inside a larger container and filling the larger container with water. The trick is to tape the smaller container to the larger container so the smaller container doesn’t move. I couldn’t get it to work, but I was using a small plastic container. I’ll have to try it with glass. If it works, I’ll do another post.